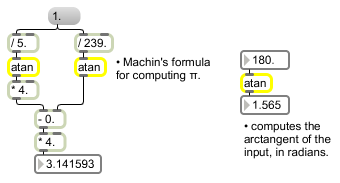 atan calculates and outputs the arc-tangent of any given number. initial-value float or int opt Sets the initial value for the arc-tangent function. bang In left inlet: Calculates the arc-tangent of the number currently stored. If there is no argument, atan initially holds 0. Input to a arc-tangent function. float: The arc-tangent of the input. int: The arc-tangent of the input.